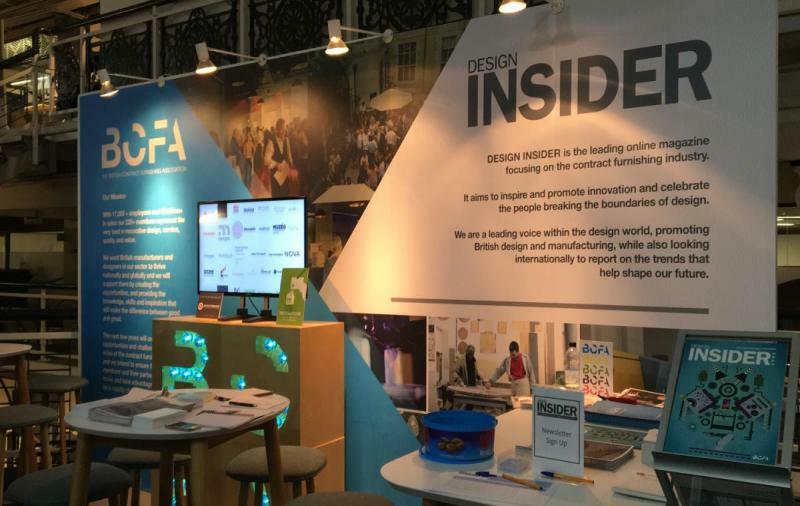 On 21 & 22 November, the BCFA and Design Insider headed to the Business Design Centre in Angel, to exhibit at Sleep, Europe’s hotel design, development and architecture event. With 48 BCFA members exhibiting at the show this year- it was the biggest turnout yet for our sister membership association! The event kicked off to a busy start on with a great buzz around the halls as people began making their way around the stands. The excitement led people up to the Sleep Set competition entries in the gallery hall, Find out who the winner was in our announcement post here. The BCFA exhibiting members commented to say that it was the busiest first day they had ever seen, which is great news for this show! On the first day, Style Library Contract were the lucky winners of ‘Best Stand’ by Sleep organisers UBM, for their use of rich colours and contemporary designs. Congratulations! The bubbly drinks reception began at 5pm, to end what was a very successful day and give the visitors and exhibitors the chance to relax and network. The second day started off quiet as people were recovering from the first day and gave people a chance to catch up in meetings and visit other stands, but it was not long before the traffic built and visitors surged through the show once more. Overall, the quality of visitors was an all time high with an abundance of buyers, designers and specifiers walking the halls. In the afternoon, it was our turn to hand out the ‘BCFA Best Stand’ award. This was awarded to Newmor Wallcoverings – We were very impressed with the layout of the stand, the attention to detail and the autumnal colours used on the products displayed. Congratulations Newmor! Overall, the show was a remarkable success and it was great to see lots of new faces as well as familiar ones on our stand and as always the event provides the team the opportunity to go out and speak to a large number of members. A hot topic of discussion over the two days was next years Sleep event moving to Olympia. We will be getting the low down from Sleep Brand Director, Joel Butler about the move and what to expect. Keep your eyes peeled on for an exclusive Q&A coming soon!